The tekko, a traditional Okinawan weapon-tool, is found in a variety of forms. 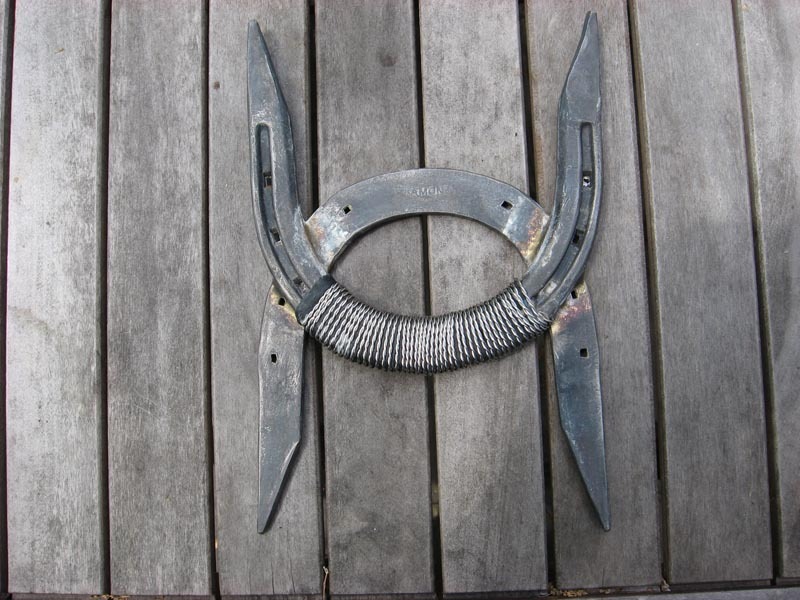 The original tekko was likely a horse shoe or modified horseshoe. Tekko (鉄甲). Tekko is sometimes spelled ‘tecchu’ is known as Okinawan ‘knuckle dusters’, have a North America equivalent known as ‘brass knuckles’. If you decide to train with the North American version, it is best not to ‘horse’ around and get on the wrong side of the law. Brass knuckles have been outlawed in some states and some countries just like nunchaku - so learn about local laws. As dumb as it sounds, in Arizona, one can carry a gun, assault rifle, or samurai sword; but tekko and nunchaku are considered too dangerous! The origin of tekko is not clear but it appears to have been an accessory found in stables of Okinawa. There are many varieties of tekko and one simple variety is a horseshoe or modified horseshoe. As a horseshoe, the curvature (‘U’) of the shoe was placed in the palm of the hand with two ends projected outward. The curve was usually wrapped in a rag or rope to give the defender gripping capability. Modifications included sharpened horseshoe tips, while others were made from two horseshoes tied together. Another variety of tekko originated from stirrups of a saddle. Many traditional tekko look similar to Western-style saddle stirrups, rather than stirrups used by Japanese samurai. In its simplest form, a tekko made from a horse stirrup (abumi) would have been a D-shaped tool that wrapped around a hand. As these evolved, stubs and sharpen protrusions were added to the arch to deliver greater damage. 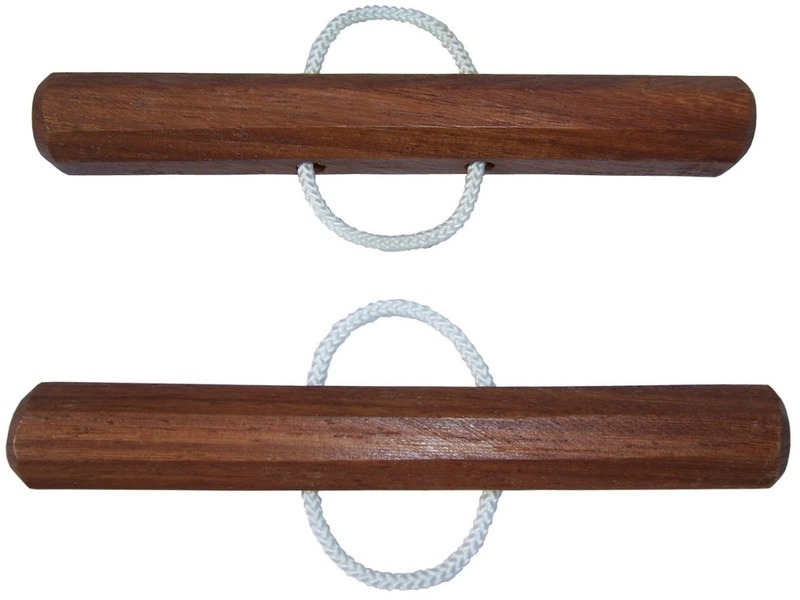 These types of tekko were made from metal and wood and the hand grip was used in striking and blocking. Another tekko was made by fishermen from a tool that assisted in hauling in fishing nets so coral would not tear their hands. Similar weapons are considered as a variety of tekko, such as the ‘yawara’ or ‘kuboton’, which are nothing more than a stick or rod held in the hand. Some had pointed tips, others had a flat surface used to strike an opponent and activate pressure points. The ‘chize kun bo’ is a short stick attached to a piece of rope looped around a defender’s finger to make it easier to retain the weapon. Other tekko is made from wood with sharpened extensions which fit between the first and second fingers. 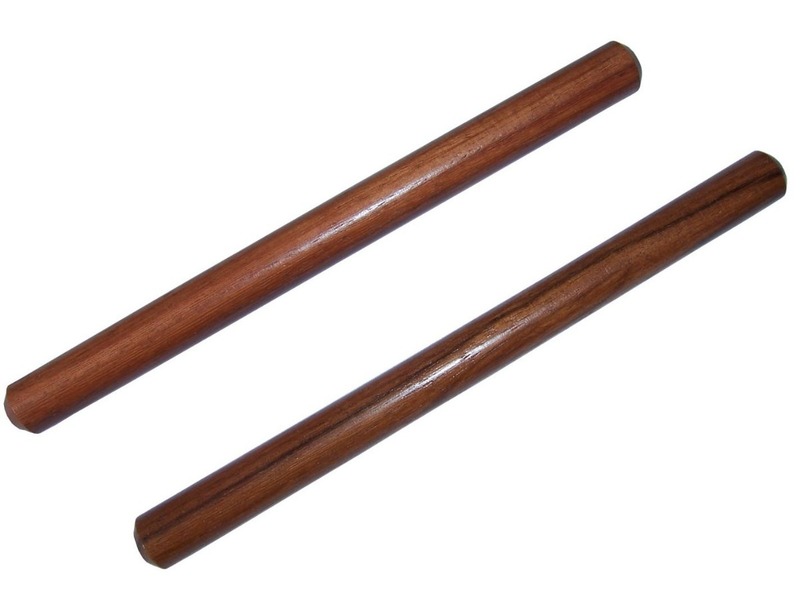 The ‘tek chu’ allowed for increased function over some predecessors - it is a wooden stick carved with a wooden extension & finger hole; or of a metal rod with a metal finger ring. The bearer held the rod in hand with the ring around one finger. The tek chu often had sharpened points. There are modern versions of tekko, such as the ninja keychain tekko and the car key tekko. In the hands of a martial artist, tekko can be a very effective weapon of self-defense for blocking, striking and pressure point activation. But few US martial arts schools include tekko in their curriculum; however, most schools affiliated with Juko Kai International train with tekko due to the teachings of Dai Soke Sacharnoski. Then there is the tekko-kagi, a farming implement used to reap weeds and considered to be more of a ninjutsu weapon. The tekko-kagi included four iron spikes that looked more like a bear claw attached to a metal ring which fit around a person’s wrist. Some of these are wicked-looking tools. Kobudo, the ancient Okinawan martial art of ancient weapons, typically goes hand in hand with karate. 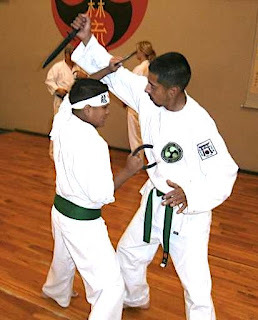 When one learns karate, they usually learn kobudo in traditional Okinawan styles - such as Shorin-Ryu Karate. Kobudo weapons are derived from peasant tools used in the professions of farming, fishing, and various merchant occupations. When Okinawan royalty decided peasants should not be armed, the peasants armed themselves with tools of trade. After all, it is the right of all people to defend their selves, families and neighbors. Similar to kobudo tools, modern tools can be used as self-defense weapons. They are everywhere - car keys, magazines, books, pens, belts, even cell phones - basically anything with an edge, significant mass, point, or method for great acceleration. As an example, one of our outstanding members - Kyoshi Adam, 7th dan, a local university professor, has demonstrated kata he created using tools of trade - including the tools of a professor and tools of today's farmer. Of course, we don't practice these kata in our system, they are for entertainment value and to make others aware of all of the potential weapons at hand. In another example, while teaching a group of Chandler librarians in the Phoenix valley, Soke Hausel introduced them to the self-defense weapons of their trade - books, magazines, cell phones, staplers, pens and other tools. One of the many traditional Okinawan kobudo weapons taught at the Arizona Hombu Karate Dojo in Mesa, Arizona is tekkō (鉄甲). 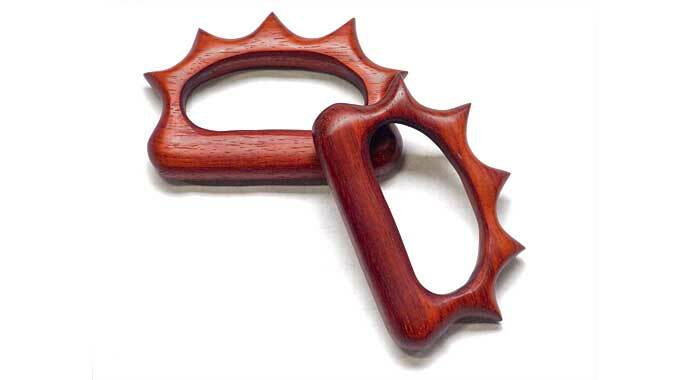 Tekko (sometimes spelled ‘tecchu’) are known as Okinawan ‘knuckle dusters’ and have a North America equivalent known as ‘brass knuckles'. But if you decide to train with the North American version, it is best not to ‘horse around' and get of the wrong side of the law. Brass knuckles have been outlawed in some states as well as in countries, just like the nunchaku. It may not make horse sense to outlaw brass knuckles and nunchaku while legalizing sharpen swords, hunting knives, fire arms and the like - especially since we have the US Constitution that allows us to arm ourselves, but unless you have a lot of money for lawyers, I recommend learning your local laws and removing legislators from office who do not support the intent of the Constitution. The origin of tekko is not clear but it appears to have originally been an accessory tool found in the ‘horse’ stables of Okinawa. There are many varieties of tekko and one simple variety is a horseshoe or modified horseshoe. The horseshoe have a curve that fits nicely in the palm of the hand with two ends projected outward. The curve can be wrapped in a rag or rope to give the defender better gripping capability. A modification includes sharpening the tips of the horseshoe, while others are made from two horseshoes tied or welded together. Another variety of tekko may have originated from stirrups of a saddle. Many traditional tekko look similar to Western-style saddle stirrups, rather than stirrups used by Japanese samurai. In its simplest form, such tekko made from a horse stirrup (abumi) would have been a D-shaped tool that wrapped around the hand. As these evolved, stubs and sharpen protrusions were added to the arch of the stirrup to deliver greater damage. These types of tekko were made from both metal and wood and the hand grip was also used for striking and blocking. Similar hand weapons considered as a variety of tekko, include ‘yawara’ or ‘kuboton’, which were nothing more than a stick or rod held in the hand. Some had pointed tips, others had a flat surface that was used to strike an opponent as well as activate pressure points. The ‘chize kun bo’ was a short stick attached to a piece of rope that looped around the defender’s fingers to make it easier to retain the weapon. Other tekko were made from wood with sharpened extensions which fit between the first and second fingers. The ‘tek chu’ allowed for increased function over some predecessors as it consisted of a wooden stick carved with a wooden extension & finger hole, or of a metal rod with a metal finger ring. The bearer held the rod in hand with the ring around one finger. The tek chu often had sharpened points. The principal difference between Okinawan tekko and brass knuckles is not only mass of the object (brass knuckles have relatively high specific gravity) but most brass knuckles have four finger holes: traditional tekko have an open slot to place the hand and fist, and generally do not fit snugly. There are modern versions of tekko, such as the ninja keychain tekko and the car key tekko. In the hands of a martial artist, the tekko can be an very effective weapon of self-defense for blocking, striking and pressure point activation. Very few martial arts schools include tekko in their curriculum; however, most Shorin-Ryu karate schools train with tekko. So, when you sign up for karate, be sure to check out the school thoroughly. Then there is the tekko-kagi, a farming implement used for reaping weeds and considered more of a ninjutsu weapon. The tekko-kagi included four iron spikes that looked more like a bear claw attached to a metal ring which fit around a person’s hand or wrist. Some of these were wicked-looking tools. A modern version of kuboton known as car keys. of trade for faculty, as modern kobudo tools. Practicing bunkai - traditional self-defense applications with tekko.